Matif wheat has finally snapped a 6-week losing streak, bouncing off a near 9-month low, amid renewed export optimism with some questioning if a seasonal low was scored at the beginning of the week ahead of the weather market and with fund positions so short. Major importers, particularly northern African countries remain active buyers of EU grains just weeks before their local harvest, which could be deteriorated by the current lack of precipitation, kicks off. Algeria was for instance reported to have booked about 450KT of wheat on Wednesday of which a large chunk would be from Europe. 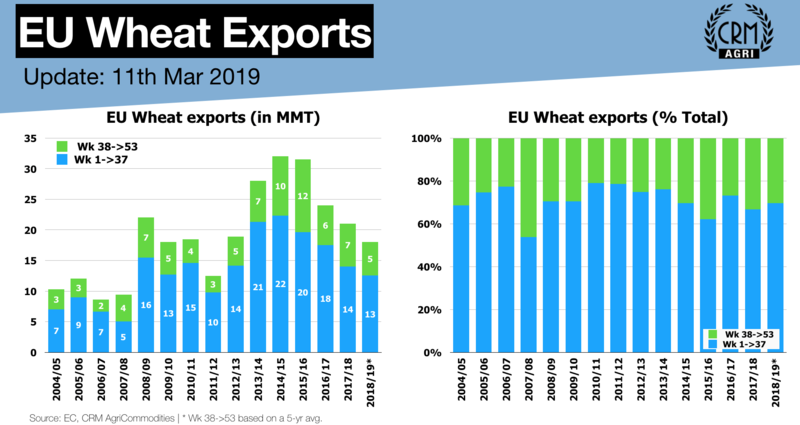 As of March 11th, the EU had exported 12.5MMT of wheat ie the lowest since the 2011/12 season and down 11% year-on-year but compared to more than -20% just a month ago. 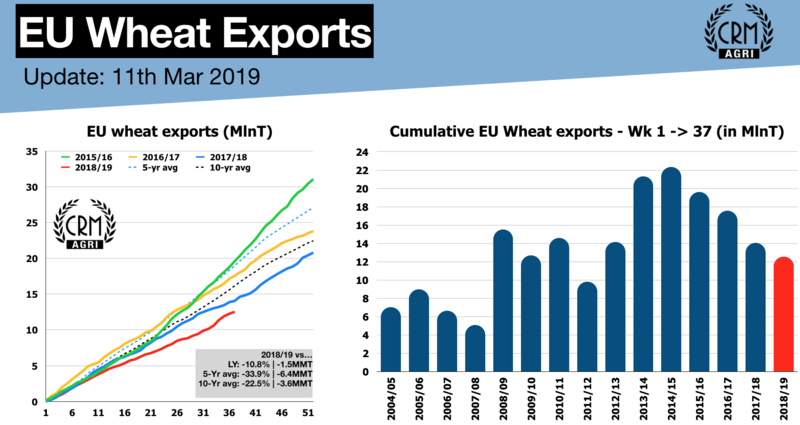 Consequently, FranceAgriMer raised its forecast for 2018/19 French wheat exports outside the EU by 650KT to a ‘conservative’ 9.5MMT. As a result, the 2018/19 French soft wheat ending stocks were lowered from 3.0MMT in February to 2.4MMT, the lowest level since 2013/14. Looking ahead, EU and Black Sea winter wheat conditions remain mostly satisfactory with beneficial rains observed over the last 10 days whilst spring plantings are off to a good start.